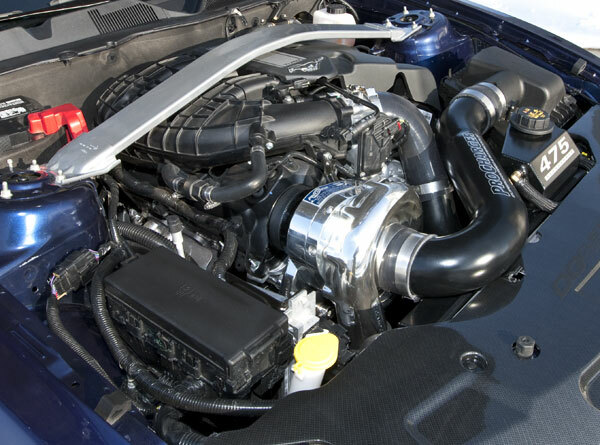 ProCharger supercharger systems are absolutely the most powerful and reliable 2011 V6 Mustang supercharger kit available . For street use or at the track, Intercooled ProCharger superchargers will deliver the largest increase in horsepower and torque available from any supercharger system. These superchargers have very low charge air temperatures especially compared to a turbocharger. ProCharger systems also provide much better engine longevity by protecting your motor from detonation much better than a turbocharger. ProCharger kits are designed with a fundamental understanding of the physics behind supercharging, and are engineered to the highest quality standards. It is this approach that allows ProCharger to offer exclusive features which improve both the performance and reliability of supercharger kits relative to other companies. For example, it is simply an undisputed fact that lowering charge air temperatures will substantially improve both performance and engine longevity, and ProCharger provides the coolest intake charge air temperatures in the industry by a wide margin. Similarly, by using CNC machining and nearly indestructable 7075 T-6 aircraft aluminum to produce the largest and strongest impellers in the industry, ProCharger is able to again improve both performance and reliability. ProChargers are the only superchargers to incorporate billet impellers in production models, and this is another example of their technical leadership. This quality and durability in turn allows customers to have further peace of mind knowing that ProCharger superchargers are also backed by the best warranty in the industry. ProCharger supercharger kits are produced from the finest materials available. All castings are poured from “virgin” 356 aluminum alloy and heat-treated to a T-6 hardness before CNC machining. ATI’s exclusive billet impellers are machined from 7075 T-6 aircraft aluminum, while the super precision bearings used in all ProCharger models are made in the USA, and are of a consistently higher quality and speed/load rating than those used by any of our competitors. In fact, ProCharger superchargers are so reliable that they are used as standard equipment by many leading boat manufacturers in the extremely demanding marine environment. Fuel-injected automotive and truck ProCharger Systems are generally 100% complete, with all the components needed for an attractive, OEM-quality installation. An exception is larger fuel injectors, as some systems exclude these, especially if larger fuel injectors are only needed for upgraded boost and power levels. All hardware is of the highest quality, and fuel-injected systems include a high-flow external fuel pump as standard equipment if necessary for proper fuel delivery. Carbureted systems are complete with the exception of the carburetor and fuel system, which depend upon an individual’s specific motor and performance needs. ProCharger superchargers are absolutely the most reliable (have the lowest failure rate) in the industry, and are backed by the industry’s best warranty coverage. It is not uncommon to find ProCharger systems warrantied for 1 year at power levels which competitors will not even warranty for 1 day. The Majority Intercooled ProCharger systems can be installed in 8-10 hours with simple hand tools. Carbureted systems can generally be installed in 4-6 hours. All ProCharger kits contain extremely thorough installation instructions with plenty of photos, illustrations and diagrams to help ensure a successful installation. ProCharger supercharger kits are also supported by the industry’s largest and most knowledgeable network of dealers. ProCharger V6 Mustang Price sheet. Download the V6 Mustang Supercharger Price Sheet. Download the Procharger 3.7L Supercharger Manual. Buy the 3.7L V6 Mustang Supercharger at the best price.